News reports suggest that the Vatican and China could reach an agreement on the appointment of Chinese Catholic religious officials. The goal is to end the split between state-controlled Catholic churches and so-called “underground” churches that obey the Pope. The Italian newspaper Corriere della Sera reported earlier this week that a Chinese delegation would visit Rome next month. Among those in the delegation would be China’s deputy foreign minister. However, some Catholics are concerned about such an agreement. They say a deal would normalize relations between the Vatican and China without dealing with the division between official and unofficial churches in China. Jonathan Liu is a priest with the Chinese Christian Fellowship based in San Francisco, California. He says the agreement will do more harm than good for the independence of Catholics in China. He described the agreement as “spiritual torture” to Chinese Catholics. And he said that it would be considered, in his words, a “betrayal” by members of the underground church movement. The Chinese government cut relations with the Vatican in 1951. Catholics can only legally attend state-controlled Catholic churches. Church leaders, such as bishops, in the state-controlled churches are appointed by the Chinese government rather than the Vatican. Underground churches, however, say they are loyal to the Pope. 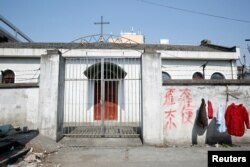 Anthony Lam is an expert on the Catholic Church in China. He estimated that the country’s Catholic population decreased to 10.5 million in 2016. However, ties between the Vatican and the Chinese government have improved under Pope Francis. In January, the Vatican asked two underground bishops working in China to be replaced by two who were approved by China. Joseph Zen is a retired Cardinal, a top church official. He has criticized the improving relations between the Vatican and the Chinese government. He wrote that the talks with Chinese officials would only give control of the Catholic Church in China to the government. Zen, who also is the former bishop of Hong Kong, said that talks between the sides had not been equal. He said he had heard reports that China refused to discuss Bishop James Su. Zen said Su had been in the hands of the Chinese government for more than 20 years. “Accepting their [China’s] refusal is like kneeling down to them from the outset,” he said. Historic change or political move? However, supporters of the effort to improve ties do not agree. Francesco Sisci, a former Italian diplomat, is now a researcher at China Renmin University. He said a deal does not hurt the principles of the Holy See, the government of the Catholic Church in the Vatican. Instead, he said the move could be a way to bridge, what he called, gaps between China and the rest of the world. He noted that the world’s 230 Cardinals, except Zen, and all bishops in China, have agreed with the Pope’s decision. 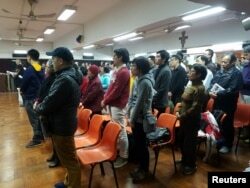 About 200 Catholics attend a prayer meeting for the Chinese Church after news emerge that Beijing and the Vatican have reached a deal on bishop appointments, in Hong Kong, China, Feb. 12, 2018. Hans Stockton is director of the Center for International Studies at the University of St. Thomas in the U.S. state of Texas. He says the Catholic Church is weighing the good and the harm of making a deal with China. In negotiations, China is expected to seek formal diplomatic ties with the Vatican. However, Stockton notes that such a move would hurt Taiwan which could lose the Vatican as an ally. China considers the self-ruling island a rebel province. Some Chinese have criticized the agreement on social media. They say China will be the winner in talks if the government gets to nominate candidates for bishop. Joyce Huang reported this story for VOA News. Mario Ritter adapted it for VOA Learning English. Hai Do was the editor.